Bespoke furniture and interiors designer Christian Liaigre lifts an impeccably manicured hand from the smooth, curved edge of the meeting room table above his Paris design studio and makes a tiny adjustment to his tortoiseshell glasses. He is struggling with the notion of empire building. 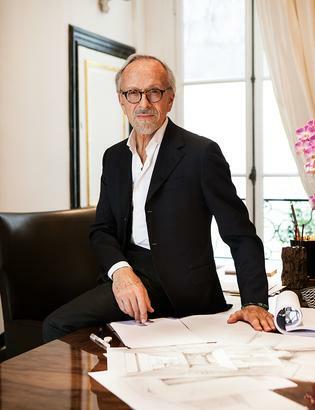 There may be a team of 20 people downstairs, drafting versions of his restrained, luxurious and highly sought-after interiors for clients from Beijing to New Delhi, but he refuses to see them as anything more than extended family. A new furniture showroom is opening in the spring at Conduit Street in London’s Mayfair (taking the global total to 20) while a Paris-based specialist yacht studio (headed by Guillaume Rolland, his studio manager) opened its doors in December. But Liaigre insists that not one of these enterprises has anything to do with building an international brand. For a man whose aesthetics rest in powerful understatement, it is hardly surprising that he is defiantly elusive when asked to define his style. It is, he insists, an evolution, a distillation of influences built up over many years. Growing up by the Atlantic in La Rochelle, on the west coast of France, he admits to being deeply moved by nature, with an instinctive respect for natural materials and a love of the sea. “And you can see that I like wood,” he says, gesturing to the scores of samples resting – in what could be mistaken for an art installation – against the white walls of the meeting room. “Every day I search for new ways of using and transforming wood without losing its personality.” Traditional craftsmanship is also a recurring theme in his work, with the bulk of his designs being made in a French atelier he has used for more than 30 years. Rightly insisting that each of his projects should be treated as entirely separate from the next, and that the context of each will inform and influence its outcome, it is nonetheless possible to draw out a number of consistencies that run through all of Liaigre’s much celebrated work. His is an aesthetic of restraint, of quiet elegance, of subtle luxury, in which space, air and light are treated as the most valuable commodities. His colour palette is, almost without exception, sparse, his use of pattern non-existent. 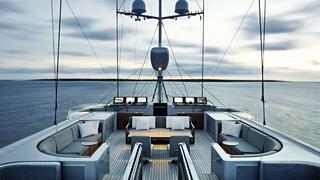 Materials, be they a tropical hardwood, a raw linen, or an Italian marble, are celebrated in their purest form. There is not a superfluous decorative element, nor a nod to passing fashion, in sight, but a simple gesture towards comfort and tranquillity. 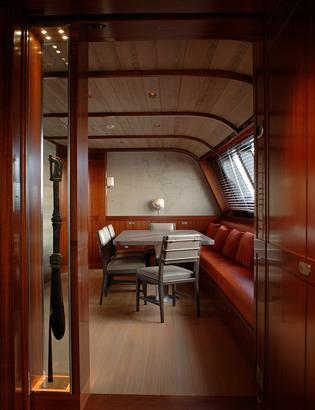 No doubt the new boat division will enable a small increase in the number of seaborne Christian Liaigre interiors but, like everything in life that is most desirable, if you want one you will probably need to put your name on the waiting list.